Jonathas de Andrade works with a variety of media, including installation, photography, and film, and in research processes that have a profound collaborative character. His art discusses the failure of utopias, ideals, and world projects, especially in the context of Latin America, speculating on its late modernity. In his work, affections that oscillate between nostalgia and eroticism, as well as historical and political criticism, are employed in addressing such themes as the world of labor and workers and the identity of the contemporary subject, almost always represented by the male body. 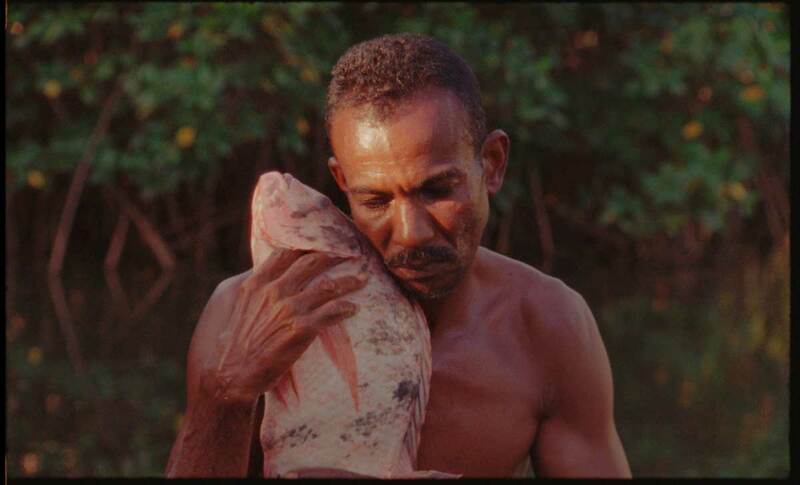 The film O peixe [The Fish] (2016), a piece presented for the first time at the 32nd Bienal, accompanies fishermen on the tides and mangroves of the State of Alagoas, in the northeast region of Brazil, as they utilize traditional fishing techniques like nets and harpoons waiting the necessary amount of time to capture their prey. Each fisherman acts out a form of ritual: they hold the fish in their arms until the moment of death in an embrace between predator and prey, life and death, worker and the fruit of his labor, in which the gaze – of the fisherman, the fish, the camera and the spectator – plays a crucial role. Situated in a hybrid territory between documentary and fiction, the film dialogues with the audiovisual ethnographic tradition.